Blessed James Benefatti, James is known as the Father of the Poor. 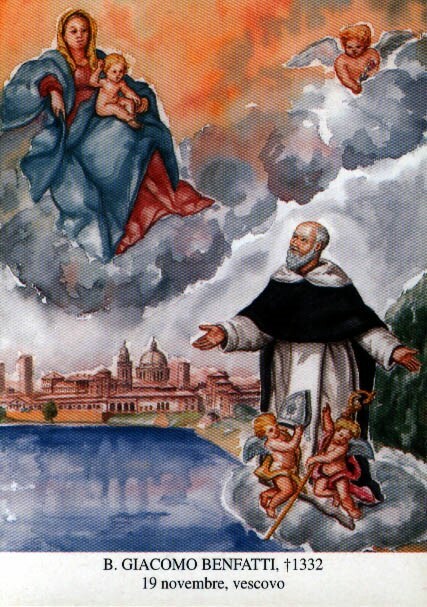 He was a Dominican at Mantua, Italy in 1290, and was a Doctor of theology and a priest. He was also a friend and brother friar of Nicholas Boccasino who later became Pope Benedict XI, and for whom James held several support offices including papal legate. He was the Bishop of Mantua in 1303, and noted for his devotion to the poor. James rebuilt his cathedral and refurbished churches and was appointed Papal legate for Pope John XXII. He died 19 November 1332 at Mantua, Italy of natural causes. His body was found incorrupt when exhumed both in 1480 and 1604. He was beatified in 1859 by Pope Pius IX.